Interested in what’s happening around the world in November? Check out some of the awesome events taking place across the globe this month! Just a few hours from Mexico City, this huge festival is inspired by Mexico’s famous Dia de Muertos (Day of the Dead) celebrations. 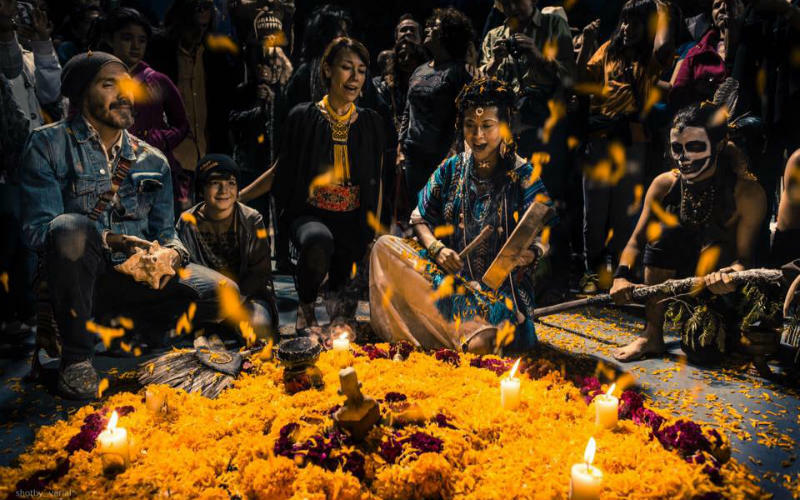 Held in San Miguel de Allende, La Calaca’s daytime program includes art installations, creative workshops and talks, cultural activities, film screenings, and more. At night, the festival comes alive with vibrant parties, costumed processions, and musical performances that last well into the morning. The Calavera Catrina (“sugar skull”) parade is a fantastic event to both witness and photograph, so head to San Miguel de Allende this November to celebrate Dia de Muertos in true Mexican style. La Calaca Festival, Mexico. Image Credit: La Calaca Festival. Bon Om Touk (“water festival”) begins on the full moon in November and marks the end of the wet season in Cambodia. Bon Om Touk celebrates an incredible phenomenon where the lower Mekong is filled with so much water that it reverses the flow of the great Tonle Sap River. Although celebrations are found in provinces throughout the country, the biggest festivities take place in the nation’s capital, Phnom Penh. 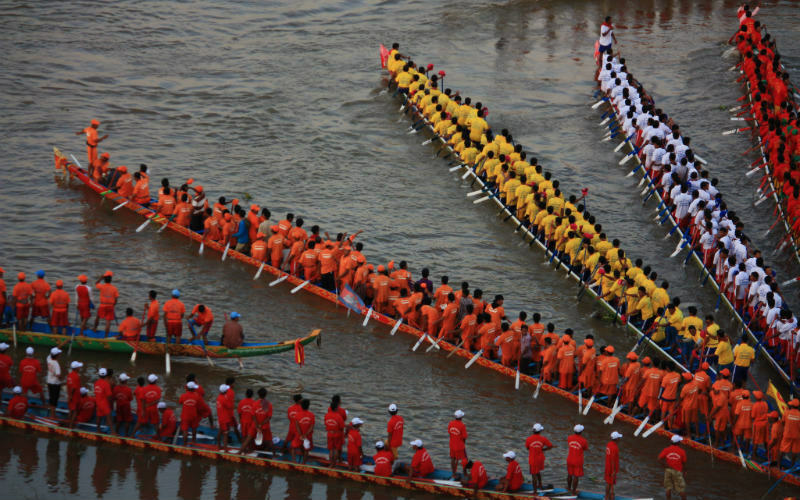 There’s dancing, market stalls, fireworks, street parties and floats, as well as the main event: boat races on the Tonle Sap River. Bon Om Touk (Water Festival), Cambodia. Image Credit: ktgauld / CC by NC 2.0. November 5th marks the foiling of the infamous Gunpowder Plot—a radical plan to assassinate King James I. More than 400 years later, people across the country light bonfires and fireworks to celebrate the fortunate circumstances which allowed the parliament to remain standing today. Just outside Brighton, the town of Lewes is home to the largest Bonfire Night celebrations in the United Kingdom. Each year on November 5th, the ‘bonfire capital of the world’ puts on a flame-fuelled spectacle that draws around 80,000 spectators to the town of just 16,000 permanent residents. 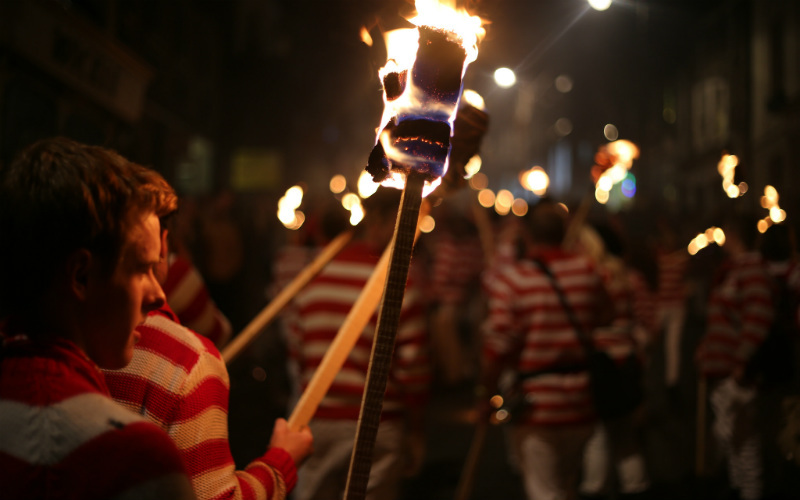 Starting around 5pm and lasting into the early morning, Lewes is taken over by marching bands, ceremonies, flaming barrel races, and street processions from around 30 visiting societies, each with their own bonfire, costumes, effigies and traditions. Lewes Bonfire, England. Image Credit: C B / CC by 2.0. 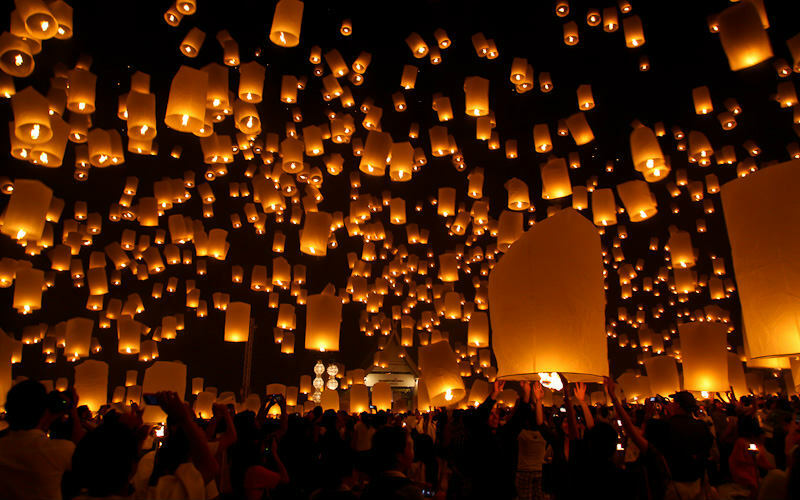 Yi Peng Lantern Festival may well be one of Thailand’s most magical annual events. The festival is celebrated on the full moon of the twelfth lunar month, when rivers are full and the moon is at its brightest; this makes Yi Peng Festival the perfect time to ‘make merit’ and invite good luck for the coming year. One of the best places to watch the celebrations is in Chiang Mai, where thousands of people light paper lanterns and set them off from the banks of the Ping River. This act symbolises letting go of previous misfortunes and also allows participants to make a wish for the future. With parades, music, street food, and thousands of glowing lanterns floating off into the night sky, Yi Peng is a spectacular sight to behold. 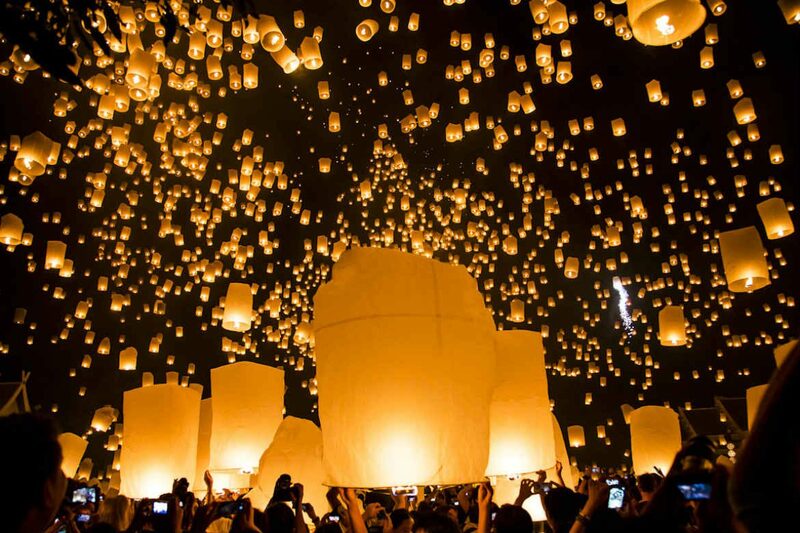 Yi Ping Lantern Festival, Thailand. Image Credit: John Shedrick / CC by 2.0. Ready to explore the world this November? Book cheap flights to hundreds of exciting destinations with Webjet! Feature Image Credit: John Shedrick / CC by 2.0.